Char-Broil is, of course, one of the leading names in outdoor cooking and while they have been able to produce some innovative products, they tend to have difficulty in the follow-through. This model, part of a large line of electric refrigerator style smokers, has digital controls and an insulated construction that promises to make it easy to use and efficient, and generally it is. For under $400USD this little smoker has good capacity and a great line of features and if yours works well, it can be a pretty good investment. The biggest caveat with all electric smokers of this type is that smoke production can be limited so if you are looking for a heavy smoke flavor, looks somewhere else. There are several models of smokers in Char-Broil's electric line. Some have windows, some have bluetooth capability and all are basic, insulated electric smokers. This model has 725 square inches of smoking space divided between four racks. That makes these racks a little more than a foot square and while they are deeper than long, they are a little small for whole racks of ribs or full briskets. However, there is a plenty of space for the average backyard cook. The Char-Broil Deluxe is a common design for electric smokers. There is an 800 watt heating element that heats a pan full of wood chips to create smoke and to control the temperature of the smoker. All of this sits inside an insulated box that holds in that smoke and heat. A temperature probe inside the box regulates the output of the heating element to keep the box at the desired temperature and a meat probe monitors the temperature of the food being cooked. This unit has a computer control system and can be programmed to hold a specific temperature until the meat reaches its target and then go into a warming mode. 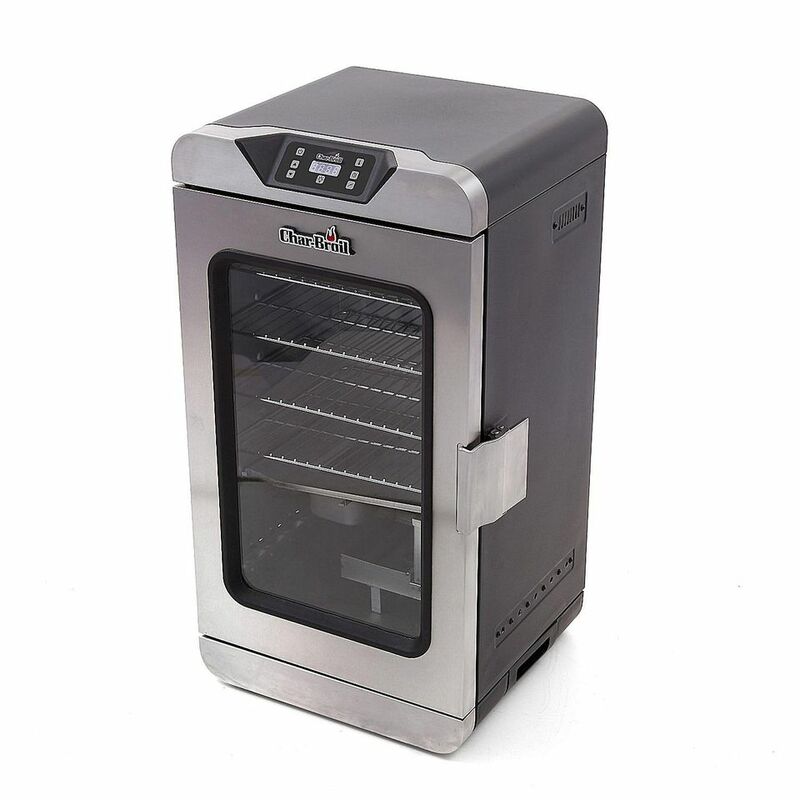 The controls are not quite as intuitive as they appear, but this smoker is still easy to use and under ideal conditions and if everything is working correctly it can be set and left to do its job for long periods of unsupervised time (up to seven hours). The truth is that this design for a smoker is simple, easy to use and reliable provided that it has been built correctly. After all, the standard electric box smoker, is little more than a small heating oven that never has to reach temperatures above 300 degrees F. What could be simpiler? If you have ever spent time looking at barbecue forums online, you find that this is not generally the case. Many of these smokers have trouble reaching and maintaining temperatures and in the quest to make them as user friendly as possible, the controls are frequently more complicated than necessary. These smokers are also some of the least expensive on the market and that means that the quality control and construction frequently leaves a lot to be desired. This brings us to this specific model. While many people are happy with the ease of use and operation of the smoker, quality control, an issue that has haunted Char-Broil for decades, remains the biggest issue. While there is a bit of a learnig curve to any smoker, this model can be unreliable in many situations. It isn't a bad smoker, it just isn't as good as it could be. Gadgets don't make a better smoker, reliable temperature control does. One last note, Char-Broil is a brand obsessed company and they frequently cover their products in display stickers that can be difficult to remove. One of the top complaints with this smoker is the large sticker that covers the front glass. It generally takes more time to remove this than it does to unpack and set the smoker up.